Legends of the High Seas is the latest release from Warhammer Historical. The book allows gamers to take to the seas as Pirates, Privateers and Royal Navy sailors of the 17th century. Printed in full color, High Seas counts 144 pages. The game is based on the Lord of the Rings combat system and the Mordheim campaign system. Followers of either of these games will find High Seas very familiar. Game play begins by creating a crew of either Pirates, Privateers or Royal Navy. Each crew contains a Captain, several heroes and is filled out with a number of henchmen . The campaign system allows for the crew to develop skills and increased traits as they survive the nine missions provided in the book. The combat system is easy to learn but difficult to master. Heroes have access to Fame and Fortune which allows characters to influence the outcome of melee, movement and shooting. The armory is sparse, with only handful of common weapon types and a small number of exotic weapons. High Seas is well presented with color photos of figures through out the book and contains a brief miniature gallery with figures from several manufactures. The book is currently available in the US at various locations including The War Store ($44.99), Scale Creep ($38.00) and Amazon.com ($37.95). For a limited time, the book also includes a ships captain figure in 25mm scale. Should everything go as planned, I will be enjoying my first game on Tuesday night. 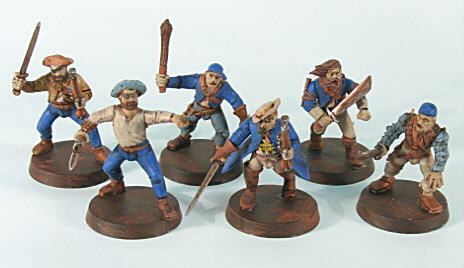 Pirate crew #2 for the Legends of the High Seas demos at Adepticon. Figures are GW Free Company plastics with minor conversions. This crew’s color theme is blue, but in all other ways they match up with crew #1 with bleach bone, medium grey and various browns as the main color choices. Bases will be completed at a later date. I recently broke my 10 year White Dwarf addiction (yes, I do measure my WD collection in linear feet) and have been looking for a replacement hobby magazine. The local library carries Fine Scale Modeler in the periodicals section & I’ve been reading through a few back issues to get a feel for the magazine. Fine Scale has always been referenced in the best light, and after reading two issues – the accolades seem well deserved. This 80+ page magazine generally publishes 4 or 5 step-by-step articles where a modeler demonstrates the use of various techniques used in the creation of a stunning tank, plane, boat or diorama. Also included in FS are 8 to 10 model kit previews/reviews and a health portion of advertising pages. Over all, a rather pleasant product filled with new ideas, but I’m not sure I’ll make a habit of purchasing this $6.50 magazine. Instead, I will continue to pick up a copies from the library to page through. WD retails for $6.00 and delivers 140+ pages, FS retails for $6.50 at 80+ pages. So much for WD being too expensive. Fully a third of FS is advertising for various model makers. Granted, the adverts come from a large number of companies instead of one and might actually be useful or interesting- but the principle is the same. In addition a substantial page count is given over to reviews of new kits by various modelers. In the WD, it is common for GW to preview new products – an effort that is dismissed by many readers as just more advertising. The main articles in FS are high end modeling content designed to raise the bar for its gronard readers. Most of the articles seem to first present a technique, then show how it is used on the model but fail to actually demonstrate how to achieve the effect. WD focus on beginning to intermediate articles that attempt to teach the new hobbyist the basic skill set (build,paint, play) needed to use the game. WD achives its goal of educating the reader as much or more so than FS. Let the old farts read FS and let the young turks read WD – just don’t confuse the target market & everyone will stay happy. You are currently browsing the archives for the wargamming category.